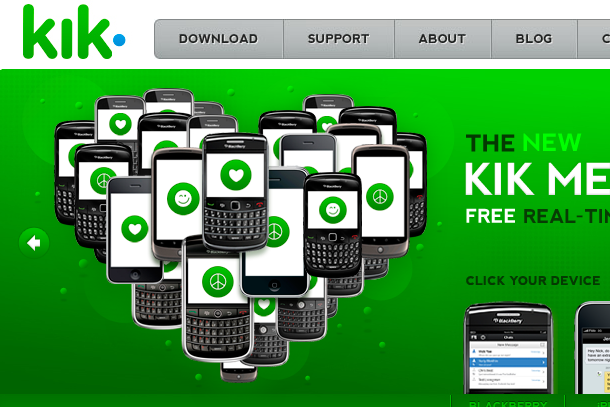 RIM became aware of a number of issues and customer concerns regarding the Kik app and service. Following discussions with Kik, the app was removed from BlackBerry App World on November 12. Upon further investigation, RIM concluded that Kik had breached contractual obligations. Based on the broad scope and seriousness of the issues and concerns, RIM terminated its agreements with Kik and withdrew RIM’s support for Kik’s service. Kik, a fast and intuitive cross-platform chat service, has been a breakout success after launching on Oct. 21 on RIM, Android (s goog) and iOS (s aapl), with 1 million downloads in two weeks and a current base of 2.5 million users. Part of the growth came from Kik’s controversial method of harvesting e-mails on a user’s phone and suggesting them as possible Kik friends. Kik apologized for the move and said the information was never shared or stored. Nonetheless, it got some wondering if Kik was violating privacy policies. RIM’s move is puzzling for a number of reasons. Kik has not been pulled by Google or Apple — an update to the Android app is now live and the Apple update has been submitted. The reversal is also surprising considering how RIM seemed to favor Kik in the past; Kik’s upcoming mobile music service was recognized at last year’s BlackBerry DevCon and RIM highlighted Kik as one of the first five featured apps to be included in its upcoming BBM platform. On a more personal note, Livingston used to work as a co-op student at RIM, has been in touch with RIM for the last two years and idolizes Mike Lazaridis, who like him dropped out of the same college in their final year to start their companies. The companies are also close neighbors in Waterloo, Ontario. It leaves Livingston with few answers. Even if Kik’s flaw was a contractual breach, RIM’s silence on the issue is only going to fuel negative speculation about the mobile device maker. Why not explain the sin and give Kik a chance to fix things? RIM’s behavior isn’t going to be good for developer relations either — if developers don’t know what line Kik crossed, how will they know to avoid the same mistake? RIM is trying hard to woo developers with its new QNX platform for the BlackBerry Playbook while building more momentum for BlackBerry OS 6.0. It’s been tough competing against Apple and Google though developers I talked to at the most recent DevCon said they were excited to see what RIM does. The company might want to be a bit more forthcoming if it wants to maintain some goodwill with developers — not to mention users. All the more reasons for start-ups to never hinge their business plans on a single bigger company. In case they are developing applications for smart phones they should build applications that are able to run on multiple devices and multiple platforms. I hope this causes the three remaining devs still writing for BB, to abandon ship. Unlike RIM ( and Apple ) Google *encourages* people to write competitive apps. I have to agree with RIM. To apologise after for using underhand tactics to gain most of your user base is a little too late. Its like me bludgeoning someone to death and then apologising afterwards – like that would make it all ok.
Good for RIM, these guys from KIK abused their trust 100% and then pleaded forgiveness due to ignorance. No way KIK is a BBM threat! There are other apps like whatsapp that actually do a better job and have a big following. Next inline getting kicked off could be Tango, as they thought KIKs address book pilferage was cool and did something similar. RIM needs to make a statement and quickly, although I doubt RIM feels Kik is a BBM threat. If Android gets the battery life and interface issues under control, BBOS 6.0 isn’t going to save RIM.